After filling in my friends about General Creasous’ most recent note, I have them a warning. They rudely shoved past me, and threw a new binder onto the table at which we were all sitting. It plopped open in front of everybody. In big bold words at the top of the file, it said GENERAL CREASOUS. I glared at him. If Harvey really was the General like I’d speculated he was, this would be the next step of his plan. Making sure nobody was actually looking for him. Eggbert asked Mike to document everything in this case file, seeing as he’s the Rebellion’s Holocron keeper. So in a way, this is mainly his case file, since I’ll be too busy going after General Creasous to write out everything that’s going on during school. It still made me pretty mad that I didn’t get to do what I do best. I’m a writer, not a fighter. “Master Foldy-Wan, a moment have you?” Origami Yoda perked up. Dwight walked over to me, looking me straight in the eyes. REALLY bad sign with Dwight. He made Origami Yoda whisper in my ear, which was a little weird, but not unexpected. Dwight sat back down, and I instantly felt a whole lot worse. My speculation about Harvey was looking more and more convincing. Harvey, me, Kellen, Sara, and Murky were chosen for this volunteer program. Y’see, we were chosen to help out these second graders with their skills. Kellen taught the kids how to draw, Harvey taught them how to fold origami, I taught them how to write, Murky taught them grammar (or, well, Murklish), and Sara taught them how to make duct tape creations! But GUESS WHO the self-elected leader of the second graders was? That’s right! The Skate Brat! I got to talk with him and hang out and such, and he’s actually matured a lot! Harvey handed everyone a sheet of paper. He told them to fold origami Jedi Padawan versions of themselves. It was awesome! A week later, we came back to help the second graders on how to fold Origami Cranes. When we came back, all of the second graders were crying. Sara asked the Skate Brat what happened. “Someone destroyed all of our origami while we were taking a bathroom break!” He started sobbing. Like, REALLY sobbing and wailing. I felt pretty awkward being in that situation, especially since I’d only recently overcome my boo-hoo/angry tears myself, so I kinda let Sara take the lead. She helped them re-fold their Origami Padawans, and she even used her old Five-Fold Yoda that Dwight gave her to teach them! 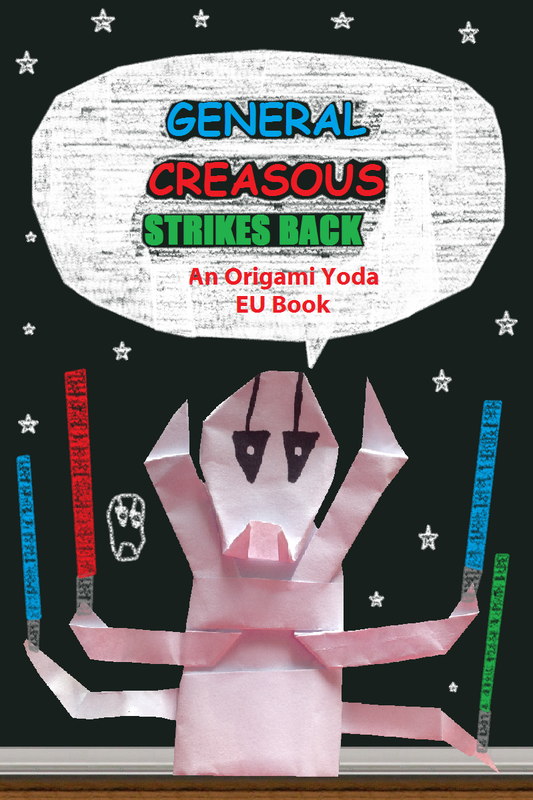 But that doesn’t change the fact that General Creasous is still out there, and this time, he was mean to little kids. That’s just evil. And I did want to mention something…Harvey helped the kids fold their “Pad-awans,” and made them happy. But what if later, just to crush their spirits, he ripped them up? It’s totally cold, but it sounds Harvey-ish. I think you’re right, Tommy. Okay, something strange happened today. We were watching a video about the crusades in history class, when we heard a loud CRASH from the next-door classroom. We saw five kids run out of the room, and we recognized two of them as Sara and Harvey. But we had no idea who the other three kids were. At lunch, we confronted Sara and Harvey and tried to make them tell us what happened. It took a while, but they cracked. Their confession is as follows…. I paused. Maybe Harvey had just made a good guess. OR MAYBE……. I eyed him suspiciously, but I couldn’t do anything about him yet. I needed proof. Harvey and Sara walked away. Suddenly, Mike ran up to me. I sat down with him, and heard him out. Now that our worst fears were realized, I reported in to the leader of the SF Protection League. It was my first time doing so, and I was really nervous. I didn’t even know who he was, other than he was a student at McQuarrie Middle School. “Um, sir?” I slowly made my way inside the room, and found a lone student sitting at his desk. He lifted his head. I began walking away, but I couldn’t help my curiosity. I turned around, wanting to find out the identity of this student to whom I’ve pledged my allegiance. I watched as he began scribbling furiously in his notebook. Under closer inspection, I recognized the notebook. I gasped. He was scratching out different chapters of the Grievous case file. “…General?” I cautioned a guess. He held up General Creasous from his pocket, and tilted his face into the light. I was sitting at lunch, trying not to draw any attention to myself, as I scanned the group of students for Harvey. Kellen was off somewhere else, and Dwight was playing Flappy Bird with his nose over at another table, so I was all alone. Sara walked up to me. “…And?” I wasn’t fond of being held in suspense. “Oh? So he wants to be your Superman now? ?” I shouldn’t have been making such a fuss out of things, but I admit, I felt pretty cheated by the SF Protection League. I mean, THEY put together this case file. THEY appointed Mike instead of me to write it. And now Chippy starts flirting with my girl?? Nu-uh! Sara followed my gaze, and we both watched Harvey step into the lunch line. “I still think he’s behind all of this,” I said. “That’s not like him, and you know it!” Sara’s voice grew louder. “Shh!” I put a finger on her lips. She gave me a death glare. I ran over to Harvey, who was reaching into his back pocket to grab some sort of origami finger puppet, and only had enough time to give him a sneer before Sara held me back. She was really strong. I settled down. Harvey gave me a puzzled look, and held up an Origami General Grievous. It was really lame, even for Harvey. He definitely didn’t fold it. It must’ve been sneaked into his back pocket earlier. “I’m being framed!” Harvey said. For once, I agreed with him. Sara walked away, and I sat back down in my seat. Alone. “Harvey will sure get hurt,” I said. He reached over to a walkie-talkie on his desk. I ran out of the room before Mike could stop me. But as I walked out of the door, two figures loomed over me, casting their shadows over me. Eggbert and Zach. I ran back inside the room with Mike, and found him talking on the phone. “Yes, Mrs. Yavada,” he said. “Thanks for the help, ma’am.” He set down the phone. Tommy burst in through the door. “Where’s the SPL leader? ?” He demanded. “I have a bone to pick with you! I believe that one of your own may be planning to vandalize the school…..” He paused. “Where’s the SPL leader?” Tommy asked. I pointed to Mike. “Time to abandon ship,” Mike ran out of the room. Zach and Eggbert stood in front of the door. I had no idea what to do next. I didn’t know what would happen with Operation Yavada. I didn’t know how or why V was able to trick Mike and the SPL into assisting the Bounty Hunters. But there was one thing I did know. There was still good in Mike, and I was going to help destroy the Splinter of the Mike’s Eye. Hey, JC. Just so you know, I’m working on my own story right now. I’ll email what it’s about because it’s not finished. Maybe some day, you never know……. But a whole love triangle with sara and tommy! Wow! I turn bad and blame Tommy?NOOOOOOOOOOOOOOOOOOOOOOOOOOOOOOOOOOOOOOOOOOOOOOOOOOOOOOOOOOOOOOOOOOOOOOOOOOOOOOOOOOOOOOOOOOOOOOOOOOOOOOOOOOO!!!!!!! !JC, how could you betray me? But I promise you, Eggbert, YOU WILL TURN GOOD AGAIN. How do you make that general creaseous ? Hey JC, how do you add a cover to a story? Me neither! : ) By the way, when will the writer finish SOTME? Splinter is being written by me and Darth Noah, and it’s looking really good! Intrusting, can’t wait for the next!!!! Don’t you mean “interesting”? Intrusting is not a word. Can’t wait 4 SOTME… when should it be finished? Art thou(are you) almost done? I’m actually not sure. This story… I’m having some trouble writing it. So, are you going to email it? I wonder hwo do you guys write the stories with each other? Send it back and forth through email, constantly adding new stuff and finally post it? or something else? How about you write, just in general, a couple chapters about Mike and Tommy teaming up and investigating the true identity of V? We will sometimes do that. DarthNoah, CJ, and I all do that sometimes. A lot of the time though, an SF sends in their OY EU story, and then I spend a few hours editing it to fit into the continuity and such. I’ll write two but, I’ll send it after the Talk Zone. Should I send a chapter through the submitter thingy? That would be totally epic!! Thanks! Awesome! Need any help with the next one? I actually can’t wait for Bounty. 1. I only made 1 chapter. 2. Did you get my Admiral Foldabar chapter? Did you get the SOTME chapter, JC? Need any help with SOTME? who folded it? instrux please! I know who V is!!!! Who do you think V is? Cut Bane’s wieldier, the guy whose name I forgot! Oh! Vernon O’Brian? His name does begin with V…. Cool idea! Origami Yoda perked up. Dwight walked over to me, looking me straight in the eyes. REALLY bad sign with Dwight. Dwight does have asperger’s, according to Tom. Same goes for Harvey. They both deal with their middle school very differently than each other, though. Harvey deals with it by putting people down to make himself feel “cool,” whereas Dwight uses it to..well…I’m actually not sure what Dwight does…he’s kind of unpredictable! Dwight is based on Tom, and Caroline is based on CeCe! They have a relationship in both the books and real life! P.S. Does Mike really hurt his eye in SOTME? Nope. It’s a reference to the Star Wars EU novel, Splinter of the Mind’s Eye, and it’s meant to reflect Mike’s dark side, the splinter of his eye…General Creasous. How do you make the General Creasous from the cover? Hey Just Noticed: V for Vendetta!